Luxmart is the top online source for luxury mobile phone accessories and devices. They have 20 years of experience supplying the highest quality tech and fashion items to discerning customers worldwide. They are fully stocked with luxury items of the highest order, luxury phone cases from Ferrari, Mercedes, BMW, Karl Lagerfeld, Cerruti 1881, Issentiel, Jean Paul Gaultier and much more. Luxmart uses leading ecommerce platform BigCommerce for their online store and had used Responsive Design. With over 85% of Luxmart’s online traffic originating from mobile devices, increasing mobile conversions was a key initiative for 2018. After identifying that the primary pain point was pageload times, Luxmart contacted Unbound earlier this year. New PWA designs were delivered and a conversion to a PWA was undertaken. 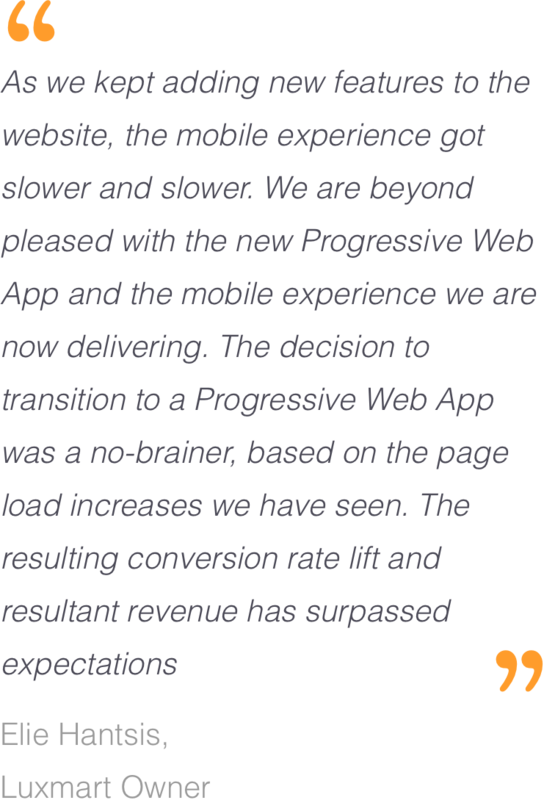 All mobile traffic is now automatically detected and redirected to the new PWA mobile experience. The mobile commerce conversion rate lift has been dramatic. 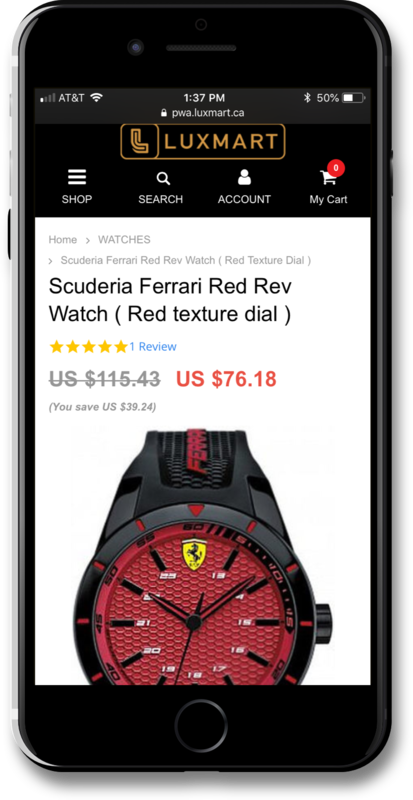 By using PWA methods such as Service Workers and on-device caching and integrating with the current ecommerce platform of the retailer, Unbound designed, built and deployed a new dedicated mobile experience utilizing PWA best practices. The result is a mobile experience that offers blazing fast pageloads, web-based push notifications and other features that have traditionally only been available in the context of a native app. Conversion rates from mobile traffic in the months prior to the PWA were .6% and leapt dramatically to 1.24% in the first 30 days after the PWA launched in early September, a 2X increase. Since then, conversions rates have continued to improve with specific days reaching 3.1%, a 520% increase. The average increase is approaching 4X. 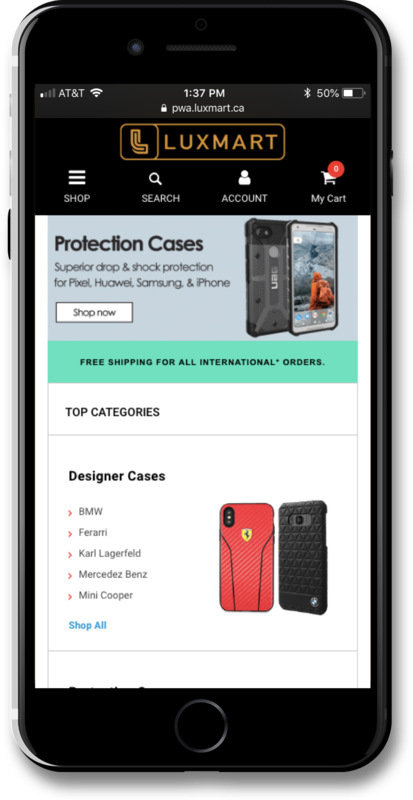 What is notable is that Luxmart tried multiple tactics to lift their conversion rate metric before the PWA conversion, and none were effective, since the speed of the site on mobile devices was the major source of friction. The key “Performance” ranking for the Luxmart PWA homepage, as measured by the Google’s benchmarking tool, increased from 67% to 99% after the PWA was launched. Across the entire site, PWA Standards compliance now measures a perfect score of 100%, according to Google.